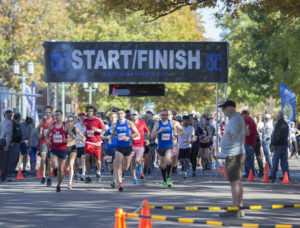 The 2018 Bryan Health Capital City Classic welcomed over 600 runners and volunteers from two to seventy-seven! 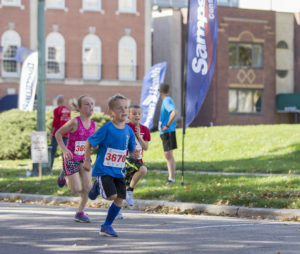 The race was held on Sunday, October 21, and featured the final Kids’ Grand Prix race of the season with a 1-mile kids’ run in addition to a 5K and 15K. The event started and finished at the majestic Nebraska State Capital. Runners and spectators were welcomed with a beautiful day and enjoyed great entertainment from the band The Innocence. Top finishers in the 15K were Mary Noel (Lincoln) with an impressive time of 58:37 and Johnny Rutford (Omaha) with a time of 48:00. Second place finishers were Meredith Smith (Sutton) with a time of 1:11 and Colin Morrissey (Omaha) with a time of 54:34. The 5K overall top finishers were Erica Doering (Omaha), with a finishing time of 17:48, and Andrew Jacob (Lincoln) with a finishing time of 16:14. Second place finishers were Sarah Fowler (Lincoln) with a time of 18:41 and Mark Abrams (Glenwood, Iowa) with a time of 16:18. Top 15K wheelchair finisher was Jason Kerkman (Lincoln) with a finishing time of 1:01 and top 5K wheelchair finisher was Connie Belt (Lincoln) with a finishing time of 36:53. The 1-mile kids’ run applauded 145 finishers. In the boys’ race, Jonah Reynolds, age 12, took first place with a time of 5:46. Taking second place was Hudson Davy, age 12, with a time of 5:59. In the girls’ race, Shianne Benker, age 13, took first place with a time of 6:22, and Kathleen Donovan, age 11, was second with a time of 7:20. Complete results for the 15K, 5K and 1-mile. This event promoted both physical and mental health and wellness, and raised $35,000 for mental health education and awareness in our community. Special thanks to The Kim Foundation, ArtFX, Pepsi, Norland Pure, Lincoln Running Company, Union Bank and Trust, Sampson Construction, and all the runners who participated in the race this year.